The Cuisinart MCP33-30HN saute pan is ideal for lightly frying a variety of meats, chicken or fish. The pan features Heat Surround™ Technology which allows even heat distribution across the bottom and side walls of the cookware, eliminating hot spots. It has core of pure aluminum in bonded to stainless steel interior for unsurpassed durability and performance. The pan has stainless steel interior which does not react to acidic foods or alter natural flavors. The cookware's Cool Grip™ Handle stays cool on the stovetop, while its lid seals in moisture and nutrients for healthier, more flavorful results. 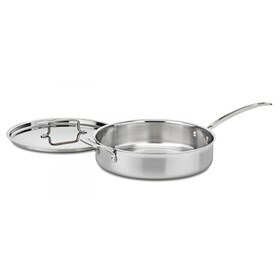 The 5.5 Qt Saute Pan W/Helper Cvr Multiclad Pro Tri Ply Ss Cookware has many exciting features for users of all types. See the 5.5 Qt Saute Pan W/Helper Cvr Multiclad Pro Tri Ply Ss Cookware gallery images above for more product views. The 5.5 Qt Saute Pan W/Helper Cvr Multiclad Pro Tri Ply Ss Cookware is sold as a Brand New Unopened Item.